The neck's susceptibility to injury is due in part to biomechanics. Activities and events that affect cervical biomechanics include extended sitting, repetitive movement, accidents, falls and blows to the body or head, normal aging, and everyday wear and tear. Neck pain can be very bothersome, and it can have a variety of causes. Injury and Accidents: A sudden forced movement of the head or neck in any direction and the resulting "rebound" in the opposite direction is known as whiplash. 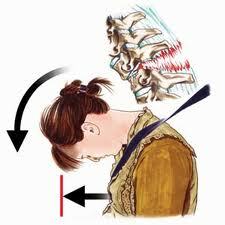 The sudden "whipping" motion injures the surrounding and supporting tissues of the neck and head. Muscles react by tightening and contracting, creating muscle fatigue, which can result in pain and stiffness. Severe whiplash can also be associated with injury to the intervertebral joints, discs, ligaments, muscles, and nerve roots. Car Accident are the most common cause of Whiplash. During your visit, Dr. Edgar Romo will perform exams to locate the source of your pain and will ask you questions about your current symptoms and remedies you may have already tried. The doctors at Romo Chiropractic of Modesto will also do physical and neurological exams. In the physical exam, Dr. Romo will observe your posture, range of motion, and physical condition, noting movement that causes pain. Dr. Romo will feel your spine, note its curvature and alignment, and feel for muscle spasm. A check of your shoulder area is also in order. During the neurological exam, Dr. Romo will test your reflexes, muscle strength, other nerve changes, and pain spread. In some instances, Dr. Romo might order tests to help diagnose your condition. An x-ray can show narrowed disc space, fractures, bone spurs, or arthritis. A computerized axial tomography scan (a CT or CAT scan) or a magnetic resonance imaging test (an MRI) can show bulging discs and herniations. If nerve damage is suspected, your doctor may order a special test called electromyography (an EMG) to measure how quickly your nerves respond. Manipulative and Physiological Therapeutics, the researchers reviewed nine previously published trials and found "high-quality evidence" that patients with chronic neck pain showed significant pain-level improvements following spinal manipulation. No trial group was reported as having remained unchanged, and all groups showed positive changes up to 12 weeks post-treatment.